St. John's School, ranked #1 in Houston (#23 in the country) wanted to enable their teachers to easily find TV clips for their lessons. For this, they installed a SnapStream Edu system. Now teachers are able to record shows to a central DVR, pull up the recordings on their laptops from anywhere on campus and create clips as needed. Even other departments, such as the athletics department and the school’s marketing department are now using SnapStream regularly. As CIO, Ritter not only teaches several classes, including an intro to Java course and one on computer hardware networking, but he’s also responsible for the technology infrastructure and integration within the school. So when Rakesh Agrawal, SnapStream’s CEO and an alum of St. John’s, approached Ritter seven years ago about incorporating SnapStream into the school’s curriculum, Ritter was open to testing it out. To use SnapStream, a teacher will log in through their web browser and either choose a show to record from the built-in program guide or pick one that has already been recorded. They can then use it to search (using SnapStream’s closed caption based TV Search capability) and clip what they want to show in the classroom. Every teacher has a laptop, and a projector with an HDMI connection, so they simply connect the projector to the laptop and play the clips from the browser. Occasionally, a teacher will want their students to watch a clip outside of the classroom and will download the clip from SnapStream and upload the clip to their course page for students to download. Almost immediately, several teachers grasped the use case for the tool and began incorporating it into their curriculum. “Our French teacher records the nightly French news because she wants her class to hear authentic voices,” said Ritter. “So, part of the homework for listening comprehension is to listen to this news program and write about what you got out of it. So, the students are working on not only the listening ear, but the comprehension, and being able to translate that into ‘this is what I learned.’” During the election season, St. John’s history teachers used SnapStream to record presidential debates and watch them with their classrooms. “SnapStream is just so intuitive, you don’t need a lot of handholding. We have some teachers that after 30 minutes of being introduced to the tool, they were like, ‘OK, I’ve got it.’"
Surprisingly other departments at the school that were not part of the original plan have also started using SnapStream. Since SnapStream is available on the LAN, anyone can be given access to it. Sports coaches will grab clips from the NCAA soccer championships and use them to teach their athletes various formations and playing strategies. St. John's is an independent, co-educational day school presenting a 13-year sequence of college preparatory training. A non-profit institution, it was founded in 1946 to provide the community with a school of exacting standards in the development of individual, spiritual, ethical, intellectual, social, and physical growth. Based out of Houston, SnapStream has been making TV/video distribution products for over a decade. From small private schools to large public-school districts (with 100,000+ students) use SnapStream to distribute announcements and broadcast TV to the classroom. 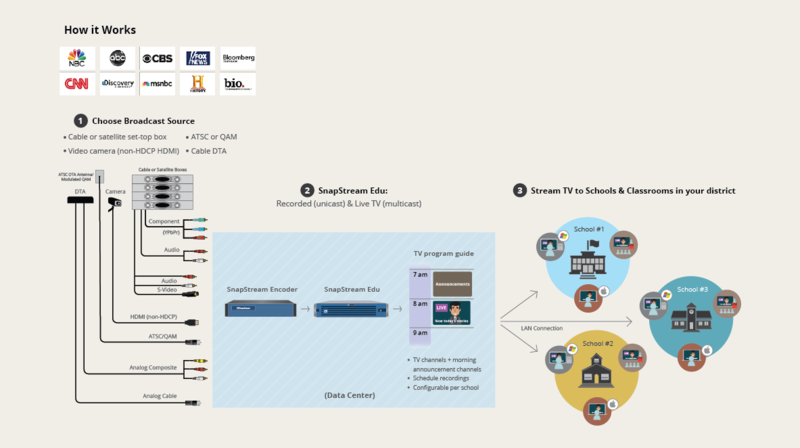 Apart from K12 schools and universities, SnapStream’s diverse list of several hundred customers also includes: The US Senate; the Library of Congress; broadcast networks such as CBS, and NBC; and news organizations like Politico.